Returning Point Park alumni bring life experience to the Pittsburgh Connections dance program. Apologizing for the gruffness in his voice, choreographer and singer/songwriter Justin Myles explains over the telephone that he strained it by shouting over the sound generated by a dozen Conservatory Dance Company students tapping during a rehearsal at Point Park University for his new work (working title: "Stack 'em"). Myles is a 2004 Point Park grad. He, three other alumni and a fifth person with ties to the university all return as guest choreographers for this season's version of CDC's annual Pittsburgh Connections program, Nov. 12-21, at the school's George Rowland White Performance Studio. His rehearsal "was like having 12 little drummers in the room," says Myles, a part-time singer and full-time dancer in STOMP. "I told them we were making music with our feet and that this was their lab to do some experimenting." That experimentation resulted in Myles' 12-minute rhythmical tap work in three sections. It's set to original music by Myles, which he described as funky but composed to leave room for the sounds of taps to take their place in it. Myles says the work's first section is powerful and fast. The second uses folding metal chairs, while the third employs the dancer's feet to generate sound. All the sections were influenced by his experience in STOMP. "I think audiences will find it to be a breath of fresh air," says Myles. Pittsburgh native Craig Kaufman is a 2005 grad and former classmate of Myles. 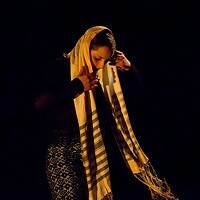 His "A Path Home" is a nine-minute contemporary jazz work for 10 dancers set to a song by Zoe Keating. The tune was re-engineered by John Nevin, who Kaufman says added more layers of instrumentation to it. A former member of Giordano Jazz Dance Chicago, Kaufman describes his work as "dealing with the choosing of one's path in life." 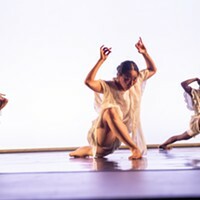 Choreographer Gina Patterson studied at Point Park summer schools as a child. The Monongahela native, now living in Virginia, is a former PBT and Ballet Austin dancer. She returns to stage her contemporary ballet "Found Songs." Patterson says the ballet was inspired by how sensory images spark memories. An example was a recent visit with her father at her childhood home, which brought back memories of heartfelt father-daughter talks when she was growing up. Patterson says some audiences have seen the 23-minute ballet for 13 dancers, set to music by Olafur Arnalds and Max Richter, "as like looking into an old photo album where memories are conjured up." Rounding out the program is Point Park alumni Dionna PridGeon's contemporary jazz piece "Outlined," with music by Bernard Herrmann and others, and award-winning choreographer and Point Park grad Kassandra Taylor's "Conversion," a quirky work set to music by The Junkman.